I picked up three of these kits in Poundland after seeing Terri mention them; I had a sift through the racks and managed to find three different image plates, so I got one of each. I've seen so many amazing manicures using stamping plates but I've always thought it'd be really hard to get right and been unwilling to spend lots of money on expensive Konad ones, so these were perfect for me to use to just have a play. P21 consists of simple floral designs; P32 is stripes in various patterns which I presume are meant to be used as French nail tips; and P48 features more floral designs but in a tribal sort of style. I decided it wasn't exactly breaking the bank to grab all three, so that's exactly what I did! Each kit contains the plate itself, plus a stamp and a scraper in matching hot-pink colour scheme. The back of the packet gives you very basic instructions on how to use the kit, although in fairness it's not exactly complicated and I managed from them! Whilst I'm sure the quality isn't as high as you might get with a more expensive kit, I was actually pretty impressed with these. 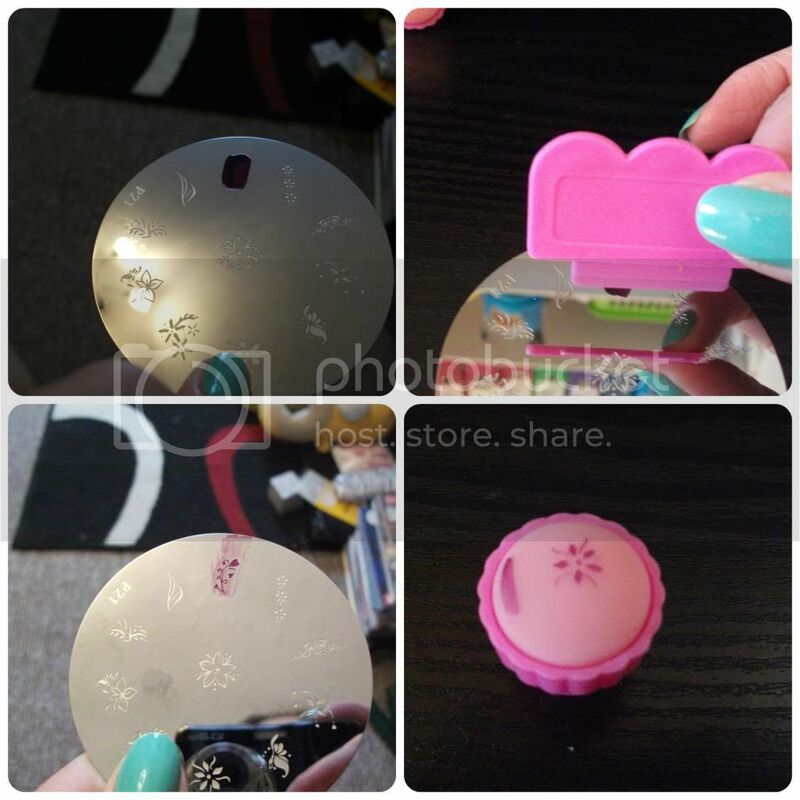 The metal plates comes with a sticky plastic covering, which you have to remove before use, and the scraper is adequate for removing excess nail polish from the plate. The stamp does a great job of transferring from plate to nail, and the material it's made off (a really spongy rubber) means that the polish literally peels off the stamp onto the nail - you don't get polish left on the stamp. It takes a little while to get the hang of the technique but once you do, it's really quick and easy to get really pretty, eye-catching designs on your nails! I used P32 in my Easter Nails, although admittedly not for its intended purpose, so I thought I'd use the other plates to put together a little tutorial today. I know these aren't the best photos, the plates are really hard to capture! I also know that the design shown on the stamp isn't the one I've shown filled with polish - sorry, I forgot to photograph it, but you can still see how it works I think! In future I'd go for maybe one or two designs repeated on all the nails, rather than trying them all out like I did here. Common sense suggests it's best to use a light base colour and a darker, opaque polish to stamp with. You can buy dedicated stamping polish, which I believe is thicker than standard polish, but I don't think there's really any need, especially as a beginner. Anything quick-drying is probably a bad idea as you need to have enough time to paint, scrape, and stamp, so you don't want it to have dried before you've done that! Here, I've used two coats of Models Own 'Jade Stone' as a base coat, and stamped with Barry M's 'Vivid Purple'. 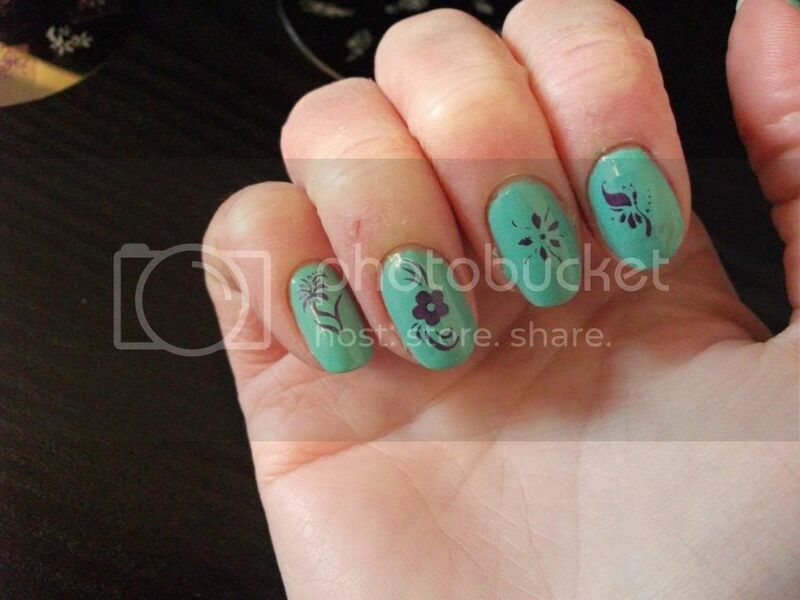 I've included a shot of my right hand, which actually came out better than my left, showing just how easy this is to do! Afterwards, the plate and scraper are really easy to clean with a little nail polish remover on a cotton pad. 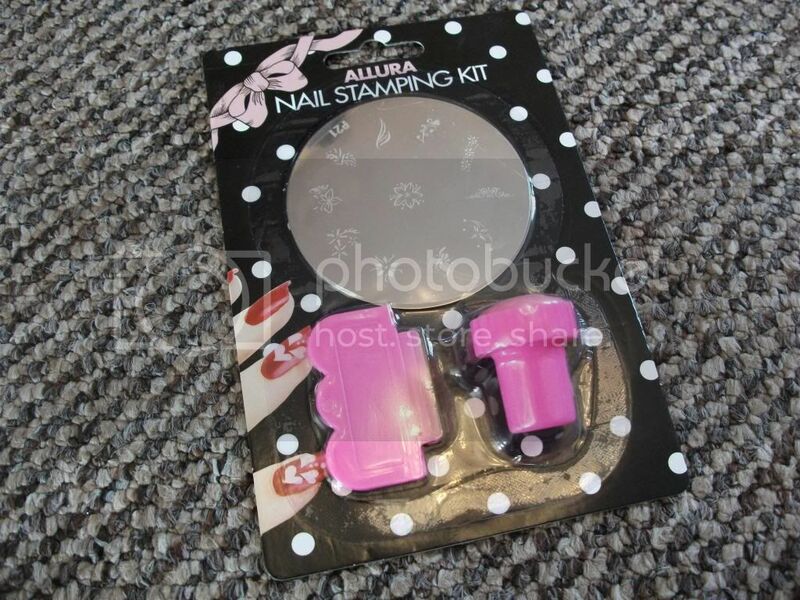 Have you seen these nail stamping kits? Would you give them a go? Or are you already a proficient nail stamper? I think I should give it a go, because it makes really cute design and it's seems so simple. oh woww its nice but I wonder from which poundland u got? I have been looking for ages for this kit in my local poundland ! I need it ! !